David Gilday – a chip designer at ARM – has got two hobbies: Playing Lego and Rubik’s Cube. He must have been tired to turn the sides of the game manually so he designed a robot to solve the Rubik’s Cube within an average of 15 seconds. 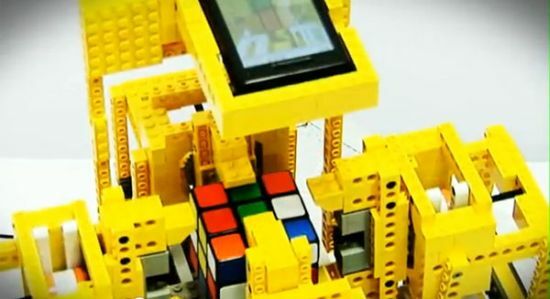 So here’s how it works: A Robot built with Legos using 6 motors and an Android phone connected to it. He’s using an ARM11 platform running Android (Looks like a Google Nexus One to me). You mix the Rubik’s Cube, place it in the middle of the robot, then it starts.. the smartphone scans all faces of the Rubik’s Cube (with the back camera of the phone), an algorithm calculates the moves (using a 300MB database), then the robot turns the Rubik’s Cube to solve the puzzle and finishes with a nice spin once the 3D-puzzle is solved. The algorithm is written in C++ and all the display and scanner part is done in Java. If you wanted to build the robot yourself it would costs around 600 GBP (Around 700 Euros). See for yourself!